We are back. It felt like the wind blew us in. Sunny trip up the road, but fought the high winds the whole way. We had great family time this week. Lots of Mommy, Daddy and Davis time. 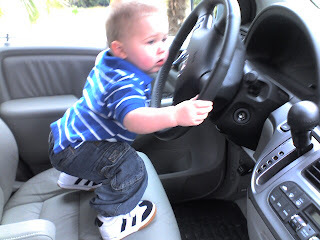 This pic is of Davis driving us up I-95 today (insert "yeah right" here). He was a fantastic traveler. Barney, nap, Elmo, nap, Veggie Tales, nap, repeat. Traveling is easy when you are 15 months and spoiled. DVD player made 1,800 miles seem like 500. Now my heart and focus shift to tomorrow's Good Friday service and Sunday's Easter Services. Getting excited about a great weekend ahead and waiting in expectation for God will do among us by the power of His Holy Spirit!